The acclaimed “Blues and Burlesque” team are delighted to come to The Hyst with their show offering the finest comedy, cabaret and live music. 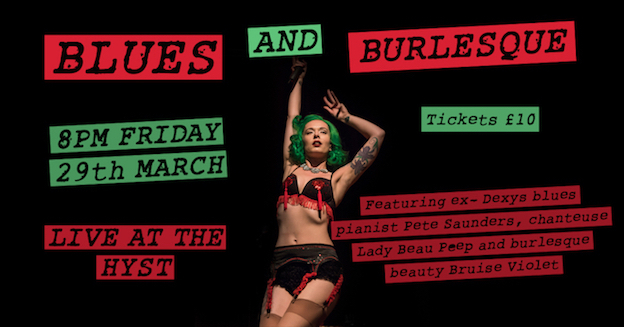 Featuring incredible blues pianist Pete Saunders, chanteuse Lady Beau Peep and burlesque beauty Bruise Violet. The show features their greatest hits of iconic songs from rock, pop, musical theatre and jazz genres. A guaranteed great night out with lots of laughs.